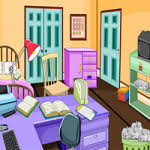 GB Study Room Escape is another point & click escape game developed by GelBold. In this game, you want to go out with your friends to party. But the door is locked, and you need to escape somehow. Find and use items and hints for solving puzzles. Good luck and have fun! Made more progress after finally noticing the second scene to the right! Now have a SD and a blue egg. stupid numbers.. must only be 1 solution.. I think my top row was 216 after I decided solution had to be unique. Accidentally BFd the color code under the TV. Apparantly the clue was the colored box, as it became inactive afterwards. I didnt do that one LOL disk into player and clue popped up.. The blue egg is a doorknob! Thanks, Leroy -- when I put the CD in, nothing happened. The other kind of random puzzle was the square mosaic tiles. Strange, I enjoyed the way the numbers spun in the number lock. Replayed to confirm SD -- didn't see the color clue from CD. However, doing puzzles in a different order and found another glitch -- I opened the 3# under the window, but couldn't take the remote which then disappeared. I had no problems, very straight forward. - they could programme their number puzzles moving faster...! - can't zoom on 3-colour-puzzle anymore, after solving TV...! Had 4 multi-colour squares in place, and they could turn.